Wine? Real men drink Home brew beer. 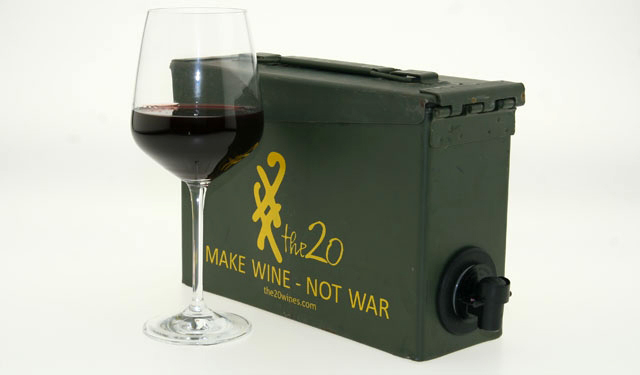 I love a good red, but honestly, I cant think of a situation where I need it out of an ammo can. Maybe at the end of a 4 wheeling adventure? I just don’t know. Maybe it’s something to impress your hunting\shooting friends while at the range or field, no? i packed a couple sandwiches, an apple and a bottle of tempranillo in a spam can for a picnic. the chick i was with was impressed as hello. damn, i wish i could be 16 again. Isn’t that made with barley and Hoppe’s? I can’t believe nobody went there! A DIY project would be better. Suit the liquor you’re drinking! Ammo can beer cooler would probably sell better. Hmmm. 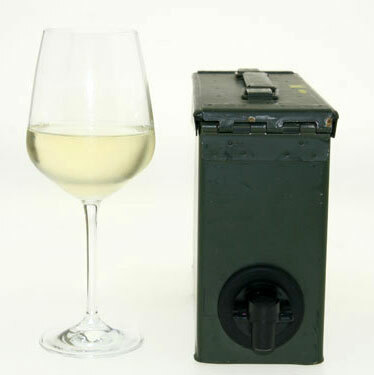 This ammo-boxed wine needs a shoulder thing that goes up and an attachment rail that you can hang spare wine glasses from. Definitively a smart idea, I’ll go for a DIT project as well. The fun part is that posibilities are endless ! Get a .50 ammo box, and you even can put ice packs inside, or a larger quantity. Get a jerrycan, and throw a WWII/Vietnam style barbecue ! Easier, use the box and crushed ice to keep your bottled beers refrigerat… refrigirate… ?? Cold! And wine ain’t just for gays. I’m with you Ray! Every beverage can be manly, as long as there is no umbrella in it ! I agree with using it as a beer cooler. I’ve got to get to work on that! You know, I manly drink beer too (preferably dark lagers and the like), but I know a couple of home vintners who are also shooters. Thanks for the tip, I’ll have to pass this on to them! And the MBWITW buys her wine in a box…she ain’t single…I ain’t gay!! Most Beautiful Wife In The World, bubba.. So WTF back at ya…. Little short on details but I think they are inserting a stainless steel liner. No ammo can I’ve ever met is stainless. My girlfriend drinks box wine and I sure would rather have this sitting on the kitchen counter rather than what’s there now! I rather like that! I make mead, and I bet that would work! What a great idea… My brewing partner’s head would explode if I showed up with some mead in such a ridiculously awesome container.